Pharmacology is the study of drugs along with their action, side effects, their metabolism, dosage and adverse drugs effects etc. There are a lot of books for pharmacology. Some are brief books and other are detailed books. We have already shared and reviewed a lot of pharmacology books like lippioncott pharmacology, katzung pharmacology and rang and dale pharmacology etc. But today, i am going to review one of the most detailed book of pharmacology that can be used both for undergraduate level as well as post graduate level. 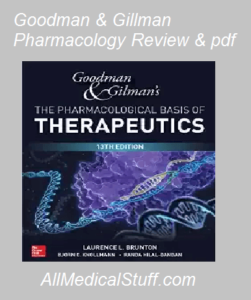 This book is called goodman And Gilmann’s Phamacological Basis of Therapeutics Or Blue Bible Or Simply Goodman And Gilman Pharmacology. Below is the complete review of this book along with features and pdf free download. 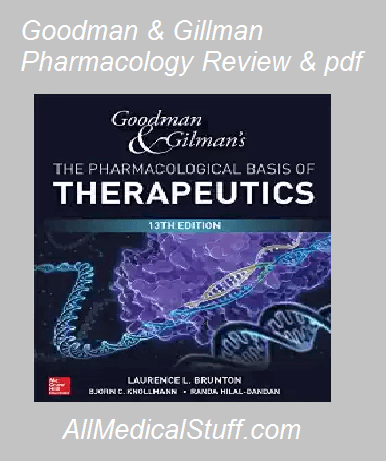 This book of pharmacology (The pharmacological basis of therapeutics) is written by Louis S. Goodman And Alfred Gilman originally. It was published for the first time in 1941 (its first edition). Till Now thirteen (13) of its editions are published. This is one of the most detailed book of pharmacology having total of 2109 pages and is used at post graduate level. It is one of the standard and detailed pharmacology book that is used all over the world. Recommended: Read our Review of Clinical Pharmacology Made Ridiculously Simple. Is is of the most detail and standard book of pharmacology. It is one of the oldest pharmacology book that is frequently updated till date and has recently the new 13th edition released. This book has 2000+ pages which indicates that it is the lengthiest book of pharmacology and therapeutics. This book has all the illustrations and tables needed to learn and revise drugs with their metabolism, effects, side effects, ADRs, distribution and elimination. it should work now. fixed. i think i don’t have 13th edition at the moment but will update the link once i get it. why do you need mega’s link when you can download this is one click with good speed?